The Singapore Book Publishers Association (SBPA) was formally established on 19 July 1968, with 22 member companies involved in the publishing, importation and distribution of textbooks. Over the years, the SBPA has grown from strength to strength, expanding its membership to 65 companies that publish on a wide range of topics in the four official languages of Singapore. The SBPA is looking for undergraduate interns to participate in its inaugural book publishing internship programme, which will now run from 25 May to 31 July 2015. Selected students can look forward to interning at one of SBPA’s participating member companies during this period (at Appendix A). Interns will also attend training seminars conducted by experienced SBPA staff on relevant skills in book publishing, such as copyediting, proofreading, book marketing and book designing. Interns will also get to tour printing and distribution companies to better understand the final stages of book production. Please complete the Internship Application Form and send the form, along with your CV to info@singaporebookpublishers.sg. 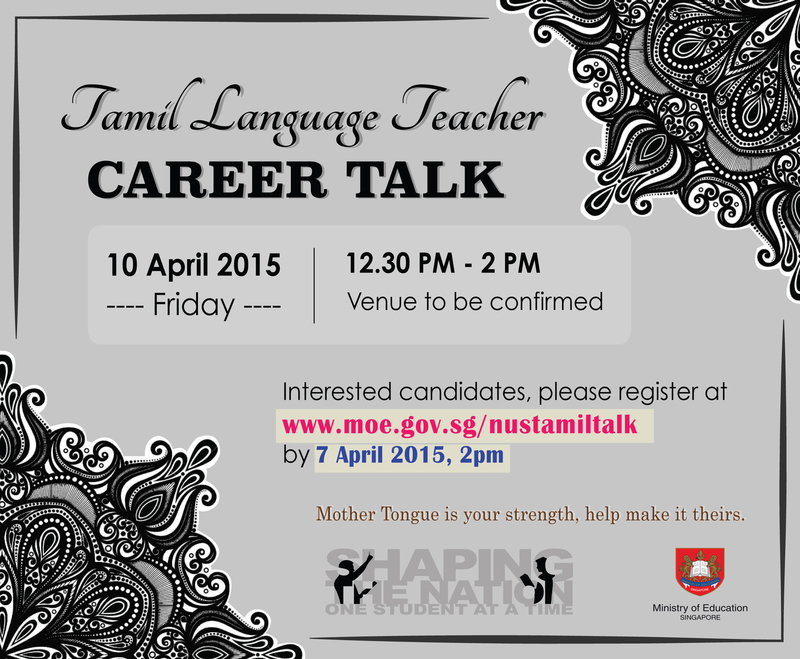 The closing date for applications is 1800hrs, on Friday 17 April 2015. Work cross-functionally with other departments/business units to develop and implement marketing campaigns. Build interest and awareness in our services through effective internal and external communication. Manage seminars and events to improve client engagement. Liaise with other departments/business units to craft internal e-mail communications, newsletters and the like. Assist in the product-launch process by writing copy for the company website and other marketing collateral. Deadline driven with effective time management and ability to work under pressure. Energetic team player and able to be learn quickly. Self-starter with initiative, creativity and a passion for the written word. Candidates with interest and knowledge of the financial markets are preferred. If you are keen to take up this internship, please send your resume to Ms Sophrine Lee at sophrinelee@maybank-ke.com.sg. Please indicate “6-month Internship in Marketing, Communications and Events” on the email subject. 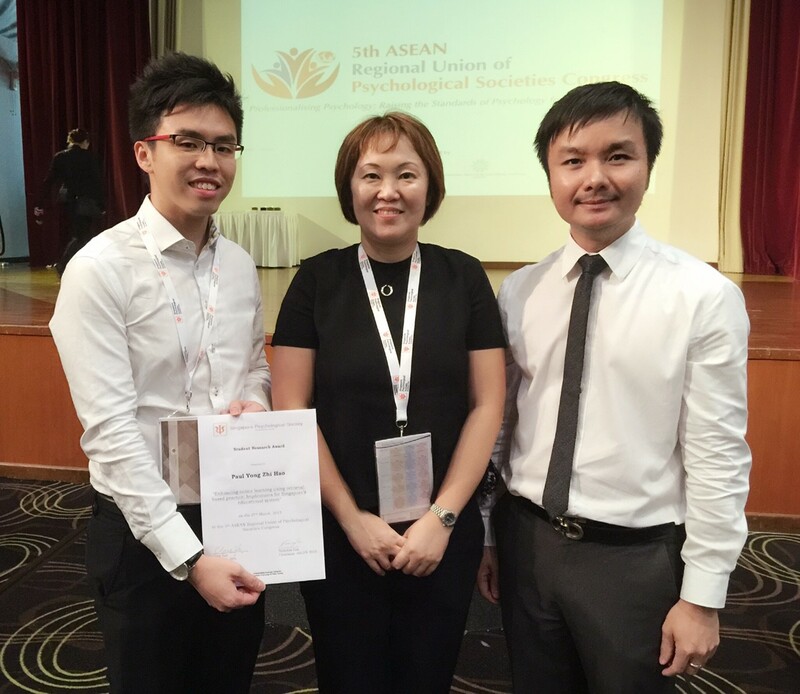 The 5th ASEAN Regional Union of Psychological Societies Congress, organized jointly by the Singapore Psychological Society (SPS) and the ASEAN Regional Union of Psychological Societies (ARUPS), took place in Singapore from 25 to 27 March 2015. Among 227 research entries that were submitted by psychologists and academicians in the region, and the 147 that were finally accepted for presentation, Mr. Yong Zhihao Paul, a recent NUS Psychology graduand and winner of the 2014 Singapore Prison Psychology Prize, has won the SPS-ARUPS Student Research Award this year for his submission titled Enhancing Online Learning Using Retrieval-based Practice: Implications for Singapore’s Educational System. This research was first pursued as Mr. Yong’s Honours Thesis at the NUS under the mentorship of Dr. Lim Wee Hun Stephen, one of NUS’s recent named Rising Stars and enlistees to her Honour Roll for Teaching Excellence. The ideal product is the student, the university graduate, who is strong, robust, rugged, with tremendous qualities of stamina, endurance and at the same time, with great intellectual discipline and, most important of all, humility and love for his community; a readiness to serve whether God or king or country or, if you like, just his community. What are you doing this Vacation? 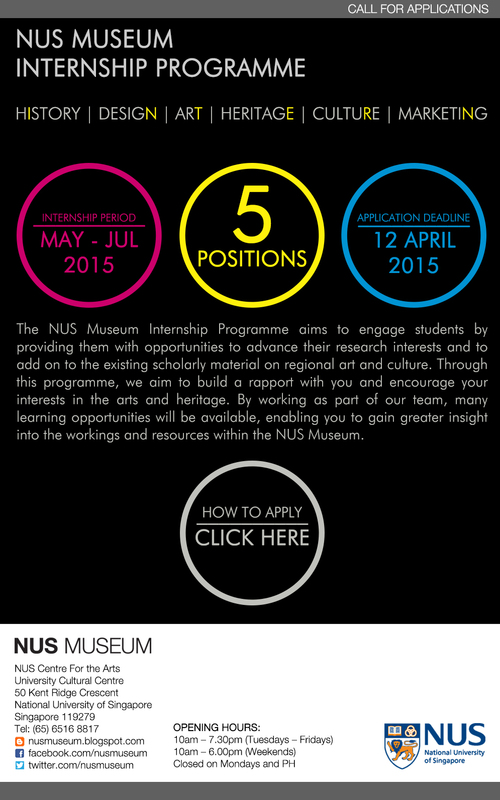 Are you planning to intern during the coming vacation or in the new academic year? Are you aware that you can receive modular credits for doing an internship? 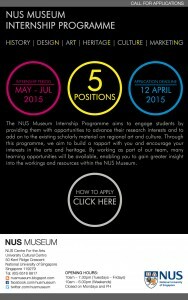 Do you have other questions relating to internships? Karen Wong, Manager for Career Preparation, FASS Dean’s Office, will outline what you should know about Internship for FASS Students. You will learn about the internship programmes in NUS, sources of internships, and who you can turn to for preparation help. Our friendly Career Advisors will be here to help answer questions as well. Please visit here to apply. This was a report on a study on price coherence, where consumers pay the same price for a given product or service, whether buying it directly from its source or through an intermediary, by Professor Julian Wright from the Department of Economics at the NUS Faculty of Arts and Social Sciences and Associate Professor Benjamin G. Edelman from Harvard Business School. The study found that price coherence actually leads to inflated retail prices, unnecessary usage of the intermediaries’ services and an overall reduction in consumer welfare. In today’s edition of The Straits Times, there was a report on the new partnership between the NUS Faculty of Arts and Social Sciences and the New York University (NYU) Tisch School of the Arts. From January next year, NUS students will be able to spend a semester at Tisch to take up film courses. In the coming years, the Faculty hopes to deepen its collaboration with Tisch and look into offering film studies as a major. This was a report on a study led by Associate Professor Annett Schirmer of the Department of Psychology at the NUS Faculty of Arts and Social Sciences, which found that saying the word “ow” actually helps people to tolerate pain longer. The research was conducted by Ms Genevieve Swee as part of her honours thesis at the Department. The results suggested that making any other sound could also help people cope with pain. The researchers added that more research is needed to find out whether the benefit of saying “ow” extends to people who suffer chronic pain. The findings were published recently in the American Pain Society’s Journal Of Pain. In the wake of increasing interest in contemporary human mobilities, including in migration, a resurgence of global labor history is underway. The basis for labor mobilization and non-free labor regimes under conditions of globalization was laid during colonialism. In this talk, I review the migration history of Javanese indentured labor beyond the borders of current Indonesia into Southeast Asia and the Pacific. Scrutinizing archival data on the Javanese allows for the drafting of a transnational history of connective labor mobility that highlights entanglements and comparabilities. Vincent J.H. Houben has been professor of Southeast Asian History and Society at Humboldt University Berlin since 2001. He was trained in history and Southeast Asian languages at Leiden University. There he obtained his Ph.D. in 1987 on the basis of a study of indirect rule in Central Java in the nineteenth century. After ten years of lecturing in Indonesian history at the same university, he moved to Germany to become a professor of Southeast Asian studies in Passau (1997-2001). Vincent Houben was director of the Institute of Asian and African studies at Humboldt University from 2004 until 2011 and has written extensively on different themes in Southeast Asian history, society, economy and culture.